Join us this August as we celebrate National Shooting Sports Month – You may even WIN A GUN! August has been declared National Shooting Sports Month with ranges and retailers all across the country joining in to promote the sport. 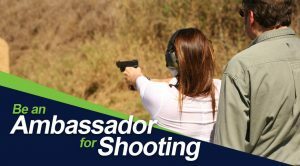 Join us as we reach out to those who have never fired a gun of any kind….or maybe have just lapsed over the years, and introduce them to the wonderful expansion our sport has undergone. Everything from Sporting Clays, to IDPA to Long Range and Tannerite. There’s something for everyone to enjoy! Yep! You can win just by showing up! Every time you check in at the front desk during the month of August, you will get a raffle ticket for a free drawing for new gun. Bring someone who’s never been to OK Shooting before and they’ll get a ticket….and you get another one. Double your chances just by bringing someone to shoot with! The winner will be chosen at random at the end of the month. We’re not doing this all by ourselves. Our friends at the National Shooting Sports Foundation have set up a website for the month complete with their own sweepstakes. Just head on over to ShootingSportsMonth.org/sweepstakes and fill in the form letting them know what an awesome time you had and you’ll be entered to win all sorts of prizes- maybe even a trip to Shooting Sports Fantasy Camp! Upon arrival, please go to the Pro Shop to sign-in. Electronic Waiver – If you have not filled out the electronic waiver after Jan, 1, 2016, save time by doing so here. All visitors- including members in good standing must watch the Range Safety Video. 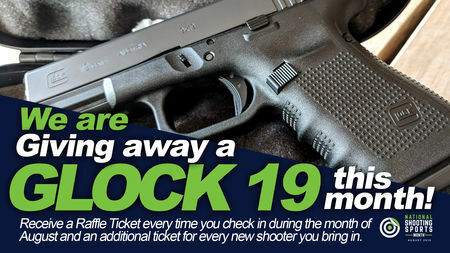 And we’re giving away a GLOCK G19 too! WHA…? Yes, that’s right. We’ll be giving away this brand new Glock G19- America’s most popular pistol and all you have to do is come to the range and check in at the Pro-shop for an entry. Come twice? Two entries? 10 times? 10 entries. And for every new person you bring- you EACH get an entry. Double the fun. Double your chances.